While Hendrix.ai transcribes your meeting discussion and summarizes it for you, you maintain full editing control over the content and format of both your transcript and final summary. 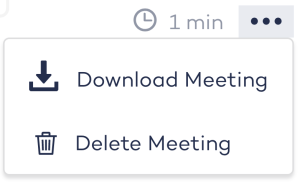 To edit your transcript and/or meeting summary, simply locate the meeting from the dashboard or the “My Meetings” section, and click to open it. The default view will display your meeting details across the top, the full transcript pane on the left, and your summary pane on the right. You can choose to only view one pane at a time by clicking the Page Layout toggles in the bottom right corner. Within the transcript or summary panes, simply click anywhere to add, change, or delete text. The summary pane offers an additional text editing toolbar for more polished content. Any edits you make will automatically be saved. While on this page you also have the ability to manually add or edit attendees.